Well, I’ve been way for a week and then I was too overexcited for the week before that to do anything sensible and before that? I dunno. It was a strange week last week. We went to Skipton with the Middles, to babysit while Mr and Mrs went to a wedding. Barney left before the rest of us and zoomed up the M1 and did some shopping and made a very good chicken casserole for us when we arrived. This was good, as the rest of us crawled up the M6 and arrived much much later. The Middles stayed in a cottage near Skipton, for a week’s holiday, and though Barney had to come home on Sunday, I stayed another two days and went up into Wharfedale on Sunday afternoon and then celebrated Mrs Middle’s birthday with her (by going to Bolton Abbey and walking for miles and miles and then having a very good cream tea). I also did some shopping for them on the Sunday afternoon and babysat on Monday while they went out for a birthday dinner. 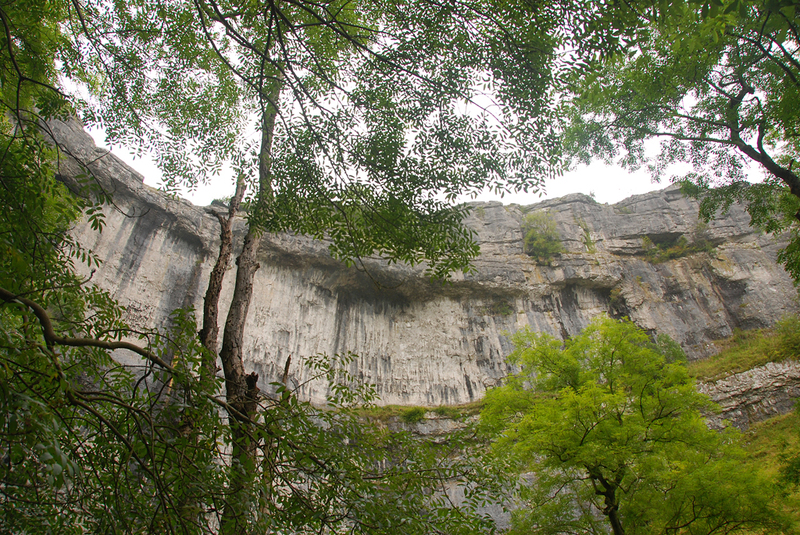 Then I took a circuitous route to Lancaster (via Malham Cove and Tarn and the hills above Stainforth, with a late detour to the Ribbleshead viaduct) and did some shopping for Eldest, whose birthday it was on Wednesday (and who had forgotten I was coming on Tuesday). On Wednesday, we all met for lunch at the Ashton Memorial Park followed by a short but very slow walk along the Trough of Bowland. (Small person likes to walk and also to investigate hollow trees and fungus and to collect acorns which she then gives to anyone who looks as though they like them – I came home with a little cache of acorns in my car). While all this was going on, I had been getting updates by text from my niece. My sister was in hospital with an infection – pneumonia as it turned out. By the end of Wednesday, it sounded as though she was doing alright so I decided not to cut short my visit with Eldest. So on Thursday, I set off down the M6 (I really am going to avoid it in future, if at all possible, it’s got much worse since the last time I went up North) and arrived in good time for an evening visit to the hospital. Unlike my last visit, when my indomitable old sister was much better than I’d expected, this time I was amazed that she was still alive. All the paraphernalia of oxygen masks and intravenous antibiotics looked like a rather crude form of torture and even with the oxygen, breathing seemed like an awful effort. Her poor face and arms were bruised by the mask and the cannula. She still managed to talk a bit, with immense effort and concentration and was obviously very pleased to see me so I was very glad I’d come. We talked, a bit, about how much she’d like to come home and tried to organise her lunch for the following day – really not an easy task when she could hardly hear and her voice was muffled by the oxygen mask – not to mention a certain amount of confusion over which meal it was and her obvious lack of interest in any of it. But she gamely made decisions – she has always been a dutiful woman and if a thing had to be done, she’d get on with it, however difficult. But she didn’t have to like it! Well, I knew she wouldn’t be coming out, short of a miracle. And actually, she died the next morning; I’m told, very easily and quickly – no seizures or fits, just, when they took the mask off to change something, she stopped; I don’t think she’d really taken on board how close she was to death – I suspect if she’d guessed, she’d have fought it. She wasn’t exactly a cheerful person but she believed in getting on with things whatever they were. As her son said, the next morning, she was a force. Not a splashy or extrovert character, but a very determined and conscientious one. Quiet-mannered, very fond of the idea that she resembled the Queen and full of decidedly stuffy old fashioned ways, she will be missed a great deal by more people than we know, I bet. Fact is, she was more like an aunt than a sister to me, being exactly fifty years older, but some time round about my thirties, we discovered that we had a lot in common even though we had very different ideas about life and how to behave. We understood each other and agreed to ignore our differences. Love? Yes of course we loved each other as far as it was possible – she was the first person ever to hold me as a new born. She was the first elderly relative I discovered as a human being and friend. (I’m not counting my Grandmother – Grandmothers are always first to let the children understand that family are also people). And we trusted each other too. She showed me her stories and I showed her my pics. We liked them. Right. I must go and find some photos of her. Not that there’s the slightest chance of her funeral being in any way “a Celebration of her Life”. That simply isn’t the way things were done in her day and it isn’t the way her children would do things now but I’d quite like to have my own little celebration for her. So – a week filled with birthdays and a wedding and ending with a death. Enough already. A photo of a bit of Yorkshire Dale. She’d have liked that – one of the things that endeared her to me was that she really enjoyed my photos – not her kind of thing at all but she genuinely liked them. And dammit! I shall never be able to get the recipe for saucer pancakes now!